Produced by Jose Maria de Oliveira in the Cerrado growing region of Minas Gerais State in southeastern Brazil. This is a dry-processed or “natural” coffee, meaning the beans were dried inside the fruit rather than after the fruit has been removed, as is the case with wet-processed or “washed” coffees. Located in southwestern Colorado, Durango Coffee lays claim to a rich coffee history that dates to 1986. Its motto is “Tough Town, Great Coffee.” Visit www.durangocoffee.com or call 800-748-2275 for more information. 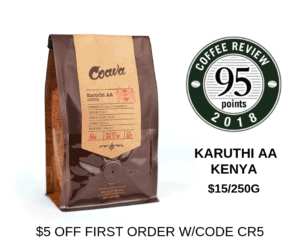 The Bottom Line: A beautiful berry-centric natural-processed coffee from Brazil, with especially high-toned acidity and deep cocoa notes throughout.